The Data Dome, based in the At-Bristol Science Centre, is a shop window facility of Bristol Is Open and the city’s smart tech initiatives. 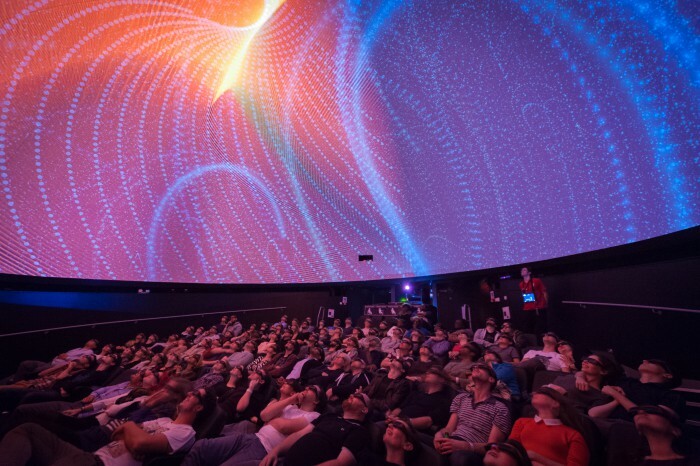 Housed in the 3D Planetarium, the Dome offers a unique audio and visual immersive experience to visualise data in new ways, explore the growing amount of sensor data and see the best of Bristol’s vibrant digital and creative sectors. One area of great promise for the Data Dome is as a showcase space for the burgeoning VR sector in Bristol, as demonstrated by this year’s bigger than ever VR World Congress event. Allowing an audience to enjoy VR content, whilst a presenter describes the content, will help developers show their work and provide a new space for digital public art. It can be difficult and expensive for an audience to be kitted out with VR headsets, so with its 98 seats, the Data Dome has great potential as an audience venue for VR videos and content – unique in the South West of England. To help us realise the potential of the Data Dome with its unusual projection environment, artist tools were needed to help make it easy for people to convert their content and take advantage of the Dome. The latest tool to be made available for the Data Dome is an experimental utility which will convert 360 videos, commonly used for VR or YouTube, to dome screens on-the-fly. For the growing numbers of creatives making 360 videos, there’s no need to render for the dome anymore – they can preview their videos on their own computers and then bring it into the dome for instant playback. The tool joins the Unity Engine to Dome converter tool, launched earlier this year at BBC Digital Bristol Week. The developer toolkit website also includes advice guides for budding Dome developers. These tools combine our last 18 months of learning about the Data Dome and are designed to reduce the technical complexity of displaying content in the dome so creatives can focus their energy on designing the audience’s experience.